Life is competitive. I think Darwins’ theory of natural selection also applies to organisations. Put simply; evolve or die. In order to survive your organisation needs to understand its customers and offer them incredible products and services. You also need to be able to anticipate change and be able to respond more quickly and more remarkably than your competition. It’s no longer good enough just to be good. It’s also no longer good enough to be very good. 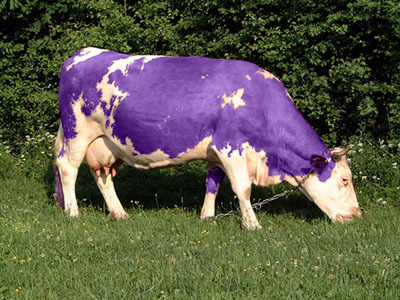 In his book Purple Cow, Seth Godin makes the point that very good is an everyday occurrence and hardly worth mentioning. Because it’s boring and expected. He claims that ‘very good’ is the opposite of remarkable. Most organisations are good. Few are remarkable. The lack of remarkableness is because people and organisations are scared to be different. They think it’s safer to be like everyone else. According to Seth this poses a problem because unless organisations are remarkable then they will not survive. See paragraph 2. Remarkable can be bad or good. If you travel by plane and get there safely you don’t tell anyone. That’s what’s supposed to happen. That’s just good or very good. What makes it remarkable is if it is diabolical beyond belief or exceeds your expectations, e.g. rude staff, dreadful food, delays or a free upgrade without you asking, complimentary champagne or arriving early. Remarkable spreads. People tell people about their remarkable experiences. Authentic remarkable can go viral across the world in minutes. So what are you doing for your donors, volunteers, beneficiaries and customers that’s very good, and how can you make it remarkable? If the answer is nothing. I suggest you get thinking – or you quit while you are ahead. This entry was posted in book review, creativity, customer service, Enchantment, Evolution, fundraising, Innovation, Inspiration, Purple cow, remarkable, social media and tagged average, beneficiaries, business, complaint, customer service, customers, Darwin, donors, good, good to great, hedgehog, insight, leadership, linchpin, marketing, organisation, plane, product, products, purple cow, remarkable, seth godin, success, survive, very good, viral, volunteers. Bookmark the permalink. thanks for this Lucy, thought-provoking, insightful and useful as always! I agree. I also think that nonprofit organisation have the brilliant opportunity to make their supporters feel remarkable. It’s the stories of supporters that matter the most – if we open up the silos, start listening, aggregating and curating THEIR stories related to our organisations, we will create an entirely new and unique voice of organisations. So glad I found you, Lucy! I enjoy your thought process. I’m currently reading Seth Godin’s book, Poke the Box. I don’t know what your experience in the UK is like, but here in the US in the South–you are definitely discouraged from risk-taking: trying new things; being extraordinary; using that passion for which the private sector is famous! How else can one get to “remarkable?” Doing things the way you’ve always done doesn’t get you there. (Who put that soapbox there!) 😉 Anyway, thanks for taking the time to blog and giving us something to think about and chew upon.